How Did a Nuclear Warhead End Up Lying in a Ditch in Arkansas? The documentary Command and Control shows just how horrifyingly vulnerable we are to errors involving nuclear weapons. The film, based on the best selling book by Eric Schlosser, tells the story of a September 18, 1980, explosion at a Titan II nuclear-missile site in Damascus, Arkansas. This may seem like ancient history in a world dominated by Twitter, Instagram, and 24-hour news cycles—Ronald Reagan was battling Jimmy Carter for the presidency, Bill Clinton was still a little-known governor from Arkansas, Diana Ross’s “Upside Down” topped the pop charts, and there was no such thing as a personal computer. But the lessons to be drawn from the events described in Command and Control are still frighteningly relevant. The risks posed by nuclear weapons, not just to countries targeted by them but to countries that possess them, are summed up in the film by a missile repairman who was 19 years old at the time of the Damascus accident: “You’re counting on everything to work perfect all the time, and things just don’t work perfect all the time.” Command and Control is a gripping account of what happens when things don’t “work perfect” at a nuclear-weapons site. It all began when a repairman at the site used the wrong wrench. Two missile-maintenance men went down into the silo to fix a problem involving low pressure in one of missile’s fuel tanks. They left behind the torque wrench that was prescribed by the regulations and used a socket wrench instead. As the two men were tightening a bolt, the socket detached from the wrench and fell 70 feet, bounced off the wall of the silo, and punctured a tank filled with 14,000 gallons of rocket fuel. None of the technicians in the missile’s control room knew what to do. As one of them put it, an accident of this kind “wasn’t on the checklist.” The fuel burst into flames and filled the silo with dense smoke that made it hard to even see what was going on. Hours later, after several courageous attempts to fix the problem, the missile exploded and its warhead was ejected. Two men died as a result of the blast. And at first no one knew where the warhead had gone. The next day it was found in a ditch near the site. It was no ordinary warhead. If it had gone off it would have unleashed more explosive power than all the bombs dropped by all sides in World War II, including the two atomic bombs. The blast would have killed millions of people. The fact that the bomb did not go off was as much by luck as by design. I won’t recount all the details between the wrench falling and the explosion in the silo, or what happened in the immediate aftermath of the accident. It is a story of how human error, technological hubris, bureaucratic inflexibility, and excessive secrecy almost spawned an unprecedented disaster. You can watch the film to fill in those details, which are told in compelling fashion, complete with interviews with men who were on the scene on the day of the accident, and a combination of real footage and realistic simulations that show how it all happened. The Damascus incident isn’t the only accident recounted in the movie, or the most frightening. In 1961 a nuclear-armed bomber broke apart over Goldsboro, North Carolina. One of the bombs was saved from going off by a single safety switch, of the kind you use to turn your lights on and off. And then there were the false alarms that almost led the United States or the Soviet Union to launch an all-out nuclear attack. In researching his book, Schlosser obtained a never-before released government assessment that revealed that between 1950 and 1968 alone there had been over 1,000 accidents, large and small, involving nuclear weapons. So what is to be done about all of this? If you’re at the Department of Energy (which oversees the nuclear-warhead complex) or the Pentagon, the answer is obvious—ask for more money. Pictures of rusting equipment and decrepit trailers on the sites of nuclear-weapons laboratories are part of a slick dog-and-pony show that is now regularly trotted out in front of Congress and the media in a cynical drive for more funds. Pay up, or the weapons and their delivery vehicles won’t be “safe and reliable,” they claim. But there are already plans to spend tens of billions modernizing the warhead complex over the next several decades. And the Pentagon has set out on a $1 trillion, 30-year effort to build a new generation of nuclear-armed bombers, submarines, and missiles. Spending a tiny fraction of that amount to pay for deferred maintenance or upgrades rather than exorbitantly expensive new systems is rarely discussed, because it wouldn’t meet the needs of the nuclear-industrial complex. And of course the ultimate goal shouldn’t be to sustain a system of nuclear overkill indefinitely, it should be to get rid of nuclear weapons altogether. That is the only way to make us truly safe from the dangers described in Command and Control. 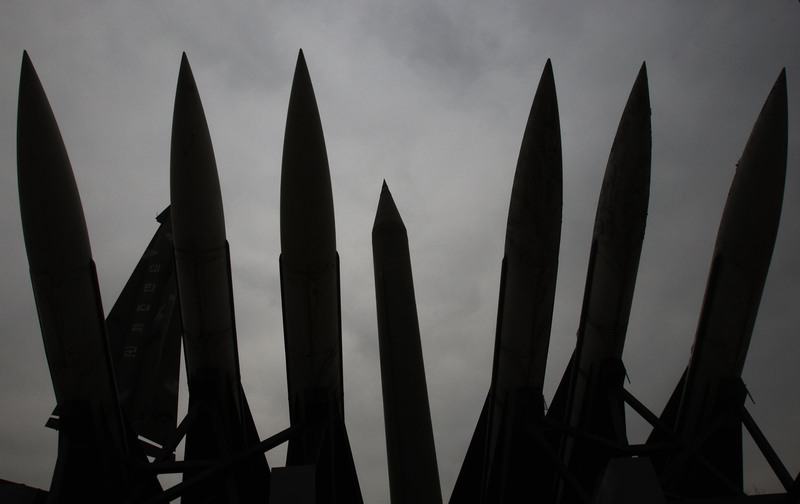 A major step in the right direction would be to make deep cuts in the US arsenal as a way to jump-start multilateral negotiations towards nuclear disarmament. A study by professors at the Air War College and the School of Advanced Air and Space Studies, respectively, suggests that it would take a little over 300 deliverable nuclear warheads to dissuade any nation from attacking the United States with a nuclear weapon. The United States currently has over 4,500, not counting a few thousand more waiting to be dismantled. Getting to lower levels, and to the ultimate goal of eliminating nuclear weapons, will require concerted political action in the United States and globally. This is a daunting challenge, but there are precedents. At the height of the Cold War, the movement to ban the bomb paved the path to a ban on above-ground nuclear testing. The Nuclear Nonproliferation Treaty (NPT) of 1968 was the result in part of citizen pressure on scores of governments that got them to agree not to acquire nuclear weapons, or to get rid of the ones they possessed. For all of its problems—most notably the failure of the major nuclear weapon states to hold up their end of the bargain—the NPT has helped hold the line against a world in which there might be many more nuclear-armed nations than there are today. The European Nuclear Disarmament movement of the 1980s kept new, destabilizing nuclear weapons from being deployed there. And the US Nuclear Freeze Campaign of that same decade helped turn Ronald Reagan from a person who joked about bombing the “evil empire” to an advocate of abolishing nuclear weapons who almost signed on to a plan to do so at his 1986 meeting with Mikhail Gorbachev in Reykjavik. And with strong support from arms control and disarmament groups, the Obama administration helped conclude and defend a multi-party deal to stop Iran’s nuclear program that held off the calls from hawks of all stripes to take military action instead. Today organizations like Women’s Action for New Directions, Peace Action, the Friends Committee on National Legislation, the Council for a Livable World, Global Zero, the Union of Concerned Scientists, and the Arms Control Association are carrying on the fight to restrict or eliminate nuclear weapons, against considerable odds. They need reinforcements. Films like Command and Control might help generate them.